Who would not love a wonderful holiday in one of the several cosy and practically furnished apartments on a large estate in the countryside. Who would not love a wonderful holiday in one of the several cosy and practically furnished apartments on a large estate in the countryside! The house has a shared wellness area with a steam room and a sauna, which can be used for a fee. Children will be delighted about a table tennis table and a swing here. A shared barbecue area with ample seating is available for all. Right next to the property is a wildlife reserve with fallow deer. Two trails lead right past the house. The mountain-bike centre Döbraberg is close by, and the beer town of Kulmbach with the Plassenburg is 25 km away. You can go on raft trips from Wallenfels. The Pressecker Knock tower offers a wide view of the beautiful Franconian forest. This observation tower built in 1985 is a landmark of Presseck and a popular hiking destination. Towards the southwest one can oversee the scenic Lautengrund. Visit the fortress Rosenburg in the medieval town of Kronach, just 27 km away. Pursue your hobby of bowling in the Gasthof Pressecker Hof. The owner serves breakfast, bread roll and lunch or dinner, which can be ordered directly with him. Cots and high chairs are available on request.The stay can also be booked from Sunday on request. This beautiful apartment is made from wood and brick and was originally built in 1995 and refurbished in 2014. The agent has rated it as a four star property so it is a well-equipped apartment with above average furnishings. It is also great value for money. 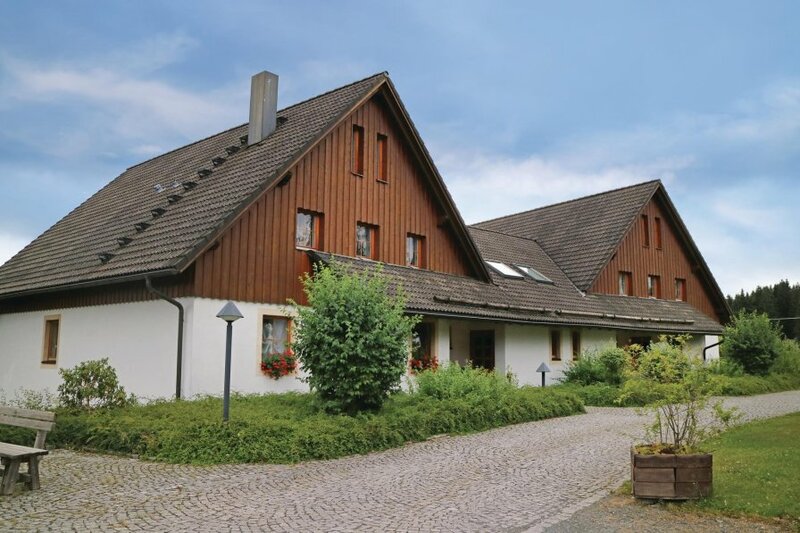 This apartment has mountain view and is located in Presseck, 25km from Kulmbach. It is set in a good location: there is a restaurant only 500 metres away. The apartment has free wireless internet. You can also park on-site at no extra charge. The apartment is adequately equipped: it has a refrigerator and microwave. The property has a sauna; it also has a shared barbecue and some shared garden furniture outside. There is a marked hiking trails nearby.